KVM switches enable users to access and control multiple computer devices from a single keyboard, video and mouse console. This includes servers, PCs, workstations and even tablet computers. 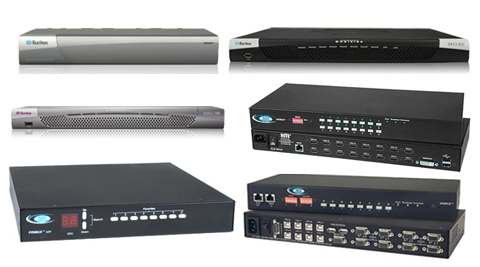 There are two major types of KVM switches: Analog switches and KVM-over-IP switches. Analog KVM Switches provide local access to multiple computers, at the desktop or up to 1000 feet away. KVM-over-IP Switches provide IP-based, BIOS-level remote access to computer devices over LAN, WAN and even the Internet. By providing centralized access and control for multiple servers, PCs or workstations, KVM switches enable businesses of all sizes to realize many benefits such as improve productivity, multi-platform solution, accelerate incident response, improve business continuity and improved security.